While there is some good evidence that Chamlain did arrive on these shores August 1st 1615, there is little to support where and on what shores he described in his writings. (Voyages of Champlain) and it is obvious that he wasn’t first as he met Father Joseph Le Caron at a native village where a cabin was already being built for him. As a real estate person working in this area for some 20 years I have driven most roads in this vicinity and run across numerous plaques denoting places of historical significance, some of which refer to Champlain and other visitors to Huronia in the fist half of the 17th century. As a public school student in the late 50s’ I was brought to Huronia on a field trip to visit the then under reconstruction historic site of Ste. Marie Among the Hurons and the Martyrs Shrine across the highway. I remember little of the lesson but do recall my impression that people died here and that this was as much a French fort as a Catholic Mission. As the manager of a local outdoor education centre in Wyevale where we planned such field trips, I recall first becoming aware of vast richness of the local history here and that this ground on which we walk and build our houses and towns is soaked with the blood sweat and tears of many divers peoples with many varied dreams and ambitions, some of whom paid dearly for their efforts and some of whom were all but annihilated in mans ever broadening search for gold and converts to a belief in “One True God”. The gold in this case was the fur of the beaver (one of our national icons) and the “One True God” was that of the Catholic Church. Other later periods in our local history such as Lord Simcoe, the War of 1812, the early pioneer settlements and graveyards pail by comparison to the drama and impact that the fur trade and clergy brought to the first recorded populace of North Simcoe. Now back to Champlain. Was he our first tourist? Was Eteion Brule our first European settler? If so, was this the birthplace of the Metis Nation of Ontario? If we are going to proudly participate in this tourist driven event “celebrating” Champlain’s arrival here, is it not important for us to understand the whys wheres and hows of this “visit”? Let us start from what we know, much of which was recorded by the principal characters of the time be they explorer or missionary. Unfortunately Brule did not read or write or we might have had an even more colourful account of the day. Let us examine their point of view when they recorded their work and for what purpose it was recorded. Let us learn from these texts and letters what this area and its people were really like and let us tell the story as it really was without a lot of conjecture and speculation. Unfortunately this can’t be done, at least not with the facts that we know, because the facts that we know only go to illustrate how much we have to learn. 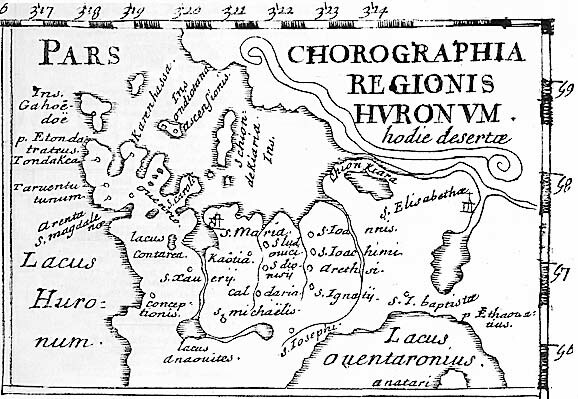 Champlain kept extensive notes of his trip across the French River route with his native guides but appears to have become overwhelmed with the expanse of the “duec Mere” or Georgian Bay and the land of the Hurons. In his book Champlain goes into much detail in describing a group of native people he refers to as the “High Hairs” or Cheveux Relevés, just before arriving at the mouth of the French River. From there on he becomes less specific when in detailing his trip down the east coast of Georgian Bay through what we call the inside channel of the 30,000 islands. He says that he travelled some 45 leagues down this coast (a French league been about 2 miles or 3.5 kilometres). Anyone who has sailed this channel can tell you that from the furthest northern access to the French River and the southern most extremity of Georgian Bay is close to 90 miles or 157 kilometres. He then says that he traveled another 7 leagues (14 miles or 25 kilometres) across the north shore of a peninsula leaving one bay behind and crossing another before landing at a village he called Otouacha that we have assumed to mean Toanche also known as or referred to as St. Nicolas, Atouacha and Toanchain in various other documents or papers. 25 Kilometers from the most easterly end of Severn Sound say Matchedash Bay traveling west across the Tiny Tay peninsula takes you well over to near Thunder Bay, not Penetang Bay, or any point further east as is currently surmised. Penetang Bay has or had a large cross (good navigational guide if nothing else) noting the landing place of Brébeuf who also says he was put off by his guides on his return trip in 1633. His native guides living some 20 leagues further distant. BreBuef states that he passed Toanche and the place of Eteion Brule’s murder on his way inland. He had stayed at Toanche on his previous visit. Where is Toanche? Is it at the North West Basin of Penetang Bay? Not likely given the 25 kilometre distance mentioned by Champlain. Is it Methodist Point or even Thunder Bay? If you travel 25 kilometres across the north coast of Tay and Tiny you could end up close to Cedar Point. Is this where Toanche was? Why is it important to know where Toanche was? Toanche gives us our first reference point or site marker from which we are able to tract Champlain’s route through Huronia. If this starting point is not correct then all calculations from there on as to the location of other points of interest are wrong. Champlain claims to have visited Carmaron a league (3.5km) southeast of Toanche and two more villages on his way from Toanche to Carhagouha where he stayed with Father Joseph LeCaron and celebrated the first mass in Ontario Aug. 12th 1615. Caragouha was some 3 to 4 leagues (14km) from Toanche according to Champlain. The Knights of Columbus have erected a large cross at what they claim to be the site of the first mass with La Caron and Champlain both in attendance. Is this Carhagouha? I have been advised from a reliable authority that despite archeological excavations around this location, no evidence of a native village has yet been found! Who puts up these markers for what purpose on what evidence? Champlain then traveled some 14 leagues (50km) east on foot passing through four or five other villages before he got to Cahiague on Aug. 17th were he was to assemble a war party to head south across through the Trent Severn area and across Lake Ontario to stage his second attack on the Iroquaw. The location of Cahiague is further difficult to determine if we do not know where we started from. We do know however by its physical description that Champlain met up with most of his warriors at the Narrows in Orillia some 3 leagues (11km) from Cahiague on Sept. 1st 1615. After being defeated in battle against the Iroquaw Champlain was forced to return to Cahiague in the winter of 1616 to recuperate from being wounded and later went back to Carhagouha to stay with his friend Father LeCaron. They apparently went on a two day journey to Petun country were they met up with the High Hairs (Cheveux Relevés) that he first met near the mouth of the French River in late July 1615. This meeting with these Nations is particularly difficult to document as to location. Where do you start from? A two days journey on foot in mid winter in Huronia is not going to take you too far. Not to where we surmise the Putunes to have lived over on the Bruce Peninsula near Collingwood. Champlain and LeCaron would have been hard pressed to get past the Nottawasaga River at Wasaga Beach in that time frame if they started in north Tiny at the purported site of Carhagouha north of Lafontain. They might have got to the Collingwood area had they started from further south. But then where was Carhagouha? Four leagues from Toanche! Where was Toanche? Our second principal character is Gabriel Sagard, not an explorer or military leader like Champlain armed with a astrolabe to assist him in knowing where he was and judging distances (albeit crudely). No, he was a Recollect friar, a bit of a linguist and later to be known as a historian with the publication of his second book called “The History of Canada” His first work was called “A Long Voyage into the Land of the Huron” This was written eight years after his return to France and is less detailed than his latter book. Sagard arrives on the scene in 1623 and promptly gets lost on his way to Ossosane . Obviously Champlain’s direction weren’t clear to him either. He says he arrived via Toanche and states that that is where the first mass took place! Some have concluded therefore that Toanche and Caragouha are the same place! He spent time in the area and his writings are a good reference for native lifestyle and environs but probably not one to turn to for directions. He had a sundial and maybe knew where he was, but not how he got there. He visited numerous villages, leaned their names and customs but was somewhat vague as to there location. It is important to note that a “mission” was not so much a place but an office with a mission to accomplish in a certain number of identified native villages or with a certain segment of the population. These “missions” therefore were even more transient than the native villages that they serviced. Native villages moved when the ground they stood on no longer serviced their agricultural or population need and would migrate to another physical location sometimes keeping the same name, sometimes not. The village population remained constant as to nation but would divide when the population grew too large or politics of leadership dictated it. In this case the village would be more likely to take on a different name sometimes reflective of its leadership at the time. During the time of Brébeuf’s second sojourn into Huronia it becomes even more difficult to determine from the writings of the time the exact location of any village or the relative location of any mission because everything was so transient. We do know that more villages were fortified because of the increase in Mohawk attacks and that some of the fortifications of the newer ones were built along European design with straighter palisade walls and some turret or gun platforms for the few armed Frenchmen who were there at the time. Ste. Marie mission was built with military design and some French soldiers were posted there. It is unclear as to whether the Jesuits were seeking retreat from the Hurons who grew more hostile toward them or just defending from the Mohawk. Ste. Marie was not located in a native village nor were the natives who attended the Mission invited to make camp within its walls. Longhouses were built outside the main compound to house the native population that was attracted there. The blurred location of the villages and missions that existed at the time of dispersal of the entire population of French and native people of the time (with the exception of Ste. Marie 1 & 2 and the village adjacent to it) is while understandable, quite significant given that the location of Ste. Louis II and Ste. Ignac are directly connected to the martyrdoms of two Catholic Saints. These sites are marked, but are they accurate? Various accounts place them anywhere within a 15km radius anywhere between and on either side of the Hog, Sturgeon or even the Coldwater River. So far, we’ve talked about what we don’t know and how difficult it might me to discern with accuracy as to where these places are and to a lesser degree what happened there. To some, a village is a village is a village. To many archaeologists the dating of the village as pre or post European contact is where the interest stops. To others it is important to know who lived there and what happened to them. It would, by digging alone, be almost impossible to identify a village by name. Unlike shipwrecks for example these villages did not sport nameplates or signage that would allow for conclusive evidence as to their name. Some however can be reasonably determined by there geographic position, size, shape and age as well as the lifestyle of those who lived there. Locating a village today becomes increasingly difficult as real estate developments take place. We are fortunate however that in the mid 1800s when our current ancestors started to till the soil, dig their ditches and build their homes that interested persons came forward to attempt to identify the strange artefacts and bones being unearthed frequently in a land assumed to be virgin territory. It is unfortunate that many of these same persons held these relics of the past including human remains in private collection or had them reburied in the bowels of academia with little to no regard to the sacredness of what had been unearthed. At this time (1880) a Dr. Tache for example clearly states that he easily was able to find a number of these village sites simply based on the directions and observations contained in the documents of 200 years earlier. He further states that he found and excavated 16 ossuaries. (ancient mass burials of the nature of the one described by Brébeuf and posted on Cty Rd 6 between the 6th and 8th Con . of Tiny by a sign by our local museum.) disinterred the bones and other sacred objects buried with the dead and sent them to a university for study and to be put on display. Lets pause for a moment and try to imagine how we might feel if the bones of our grandmother, father, sister or brother was unearthed and along with the special sacred objects of their life that were paced in their grave such as their wedding rings, favourite book, crucifix and the like were placed in the hands of strangers for study and eventually put on public display. Regardless of how sincere the motive, today this would be considered grave robbing and dealt as the hennas crime that it is. It was one of these ossuaries that was unearthed a couple of years ago right next to the Huronia Museum and Native Village and graciously reinterred by the Wendat community with the grateful assistance of the town of Midland. Who cares about all this anyway? Obviously the Province doesn’t care. It posted many of these sites with plaques in 1908 but did not maintain these markers for future reference. Does the archaeological community care, but for apparent self aggrandisement of its’ PhD researchers and to enrich the collections of various museums and universities. The general population only cares when a sites existence might deter or stop development. Those who do care, the First Nations People whose ancestors are buried beneath our feet. If we do wish to find these sites and preserve our history along with the sacred burial grounds of our first residence then perhaps we should ask the academic archaeological community to officially reveal the locations that they are aware of to the Provincial authorities that govern the Ontario Cemeteries and Heritage Conservation Acts in an effort to further protect these sites while enabling the general public and tourist alike a better, more accurate and more thorough depiction of our history and what truly lies beneath our feet. So I ask again, where is Toanche? test comment text posted just to see how the comment feature works. I was pleasantly surprised to read your narrative "Where is Toanche." I have recently become very interested in the archaeological sites in Huronia. But I am finding a strange attitude of the local people on the subject - maybe authorities as well. For example, a good friend of mine has lived in Orillia her whole life and now lives near Bass Lake, only a few minutes' drive from Warminster and the purported site of Cahiague. Neither she or any of her friends had ever heard of it! And there is no marker at the site (with strange government explanations such as "the original signage got stolen" or "the site is disputed as Cahiague" or "we don't want to encourage vandalism.") Similarly I visited the Ossosane bone pit last weekend and I would never have seen the signage if I had not gotten internet directions. Then there was a fence with a locked gate, even though it was daytime Friday and the site had electricity and street lighting. I ALMOST hopped over the fence! Finally I visited Toanche and when I asked the young woman in the gas station about the site of the Huron village of the same name she started to talk to me but was stopped by another person overhearing us who said "Be careful what you tell him." She then became evasive ("it's down a dirt road, un-marked, hard to locate, don't go there" etc. I was stunned! Last question: Is the Ossosane bone pit (ossuary) open to the public ever? Can I make arrangements to see it? Yes Bill we can most likely arrange to visit Ossossane and yes there is an air of secrecy about the archaeological sites in Huronia. I have learned a lot since I first posted this on Toanche and the first thing I learned was that the public in general is largely unaware of the rich history that surrounds them here in north Simcoe. If you wish to follow up on the questions raised in your comment, my email is jraynor@rogers.com or call me at 705 526 4927. In th summer of 1999 the people of the Wendat nations restored more than 600 of their ancestors to their burial site. Each marked by the excavators with black numbers. Returned from dusty boxes where they had sat for many years.This ossuary is sacred to the Wendat nations and not a site to be visited by the curiosity seeker. Think of the history, the loss and reclamation and perhaps you may understand more completely the need for privacy. It was at that ceremony, when the ancestors remains were repatriated to Ossossane from the ROM, that I first became acquainted with the Wendat and Wyandot descendants. For a number of years thereafter there were annual gatherings on the site that involved the Wendat from Quebec and Wyandot from the US. I was often welcomed to participate in these events and ceremonies and would assist in the maintenance of the grounds and buildings. I currently hold the key to the site and am approached on occasion to bring people to the site, learn about it's history and pay their respect and make ceremony should they wish to do so at the ossuary. I have received no direction from the Huron/Wendat FN of Quebec that this should not be done (the property is in their name) but should I receive such direction I would be pleased to comply. Thank you all for sharing your knowledge and great history that these lands have. I remember passing by that marker spot just before reaching the cottage concession road 8 to Ossossane Beach in 1967 as a young boy. My father and mother had bought the lot back in 1954. It is with deep respect that I am glad the ancestors were returned back to their people and laid to rest again. It is a very sacred place, a place of honour and respect. Little did I know it dated back to 1636! It will always hold a special place in my heart. The beauty of the area, Georgian Bay and the trees, very difficult to rival it anywhere. You can see why perhaps even back then it was deemed to be the capital of the Wendat.